I’m back in Saigon for the next couple of weeks, doing more research for my new book. Typhoon Wutip slammed through central Vietnam two days ago. Saigon wasn’t affected, though I have a friend here who comes from a village that was severely damaged. Her family has been sheltering in a church, waiting for the flood waters to subside from their home. 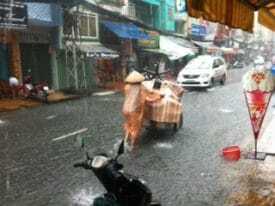 The typhoon two days ago passed north of Saigon, but yesterday and today, the city has seen heavy rains, with more expected through the weekend.